Right off the bat, in a font reminiscent of posters for feature films, she lets you know: the music, writing, story, and casting for the “Slide” video was all done by Shellz. Those familiar with the Boston-born Haitian-American singer, rapper, and songwriter won’t be surprised. Shellz has never had any difficulty taking charge. Self-assertion is a major theme of the swaggering No Category, her acclaimed 2018 mixtape, and her statements of purpose only intensified on –ily, the electrifying follow-up. However, as brassy as she can be, there’s a sensitive side of Shellz, too. The intense push and pull between independence and emotional attachment is the subject of the “Slide” clip – and Shellz, frank and forthright as always, makes that delicate balancing act manifest for her viewers and listeners. The song has already been shaking up the airwaves: the independently released “Slide” has been spun on urban stations across the country, and each week, it seems like more programmers are catching on to this dazzling new voice. It’s being played commercially and is currently the #1 most-added track at college radio. On “Slide,” Shellz announces her presence with authority, and demonstrates her flexibility, too – she sings seductively through artful vocal processing, and then raps, explosively, over a skittering trap beat. 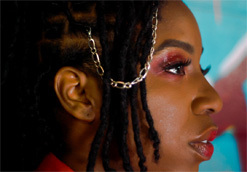 Shellz, who was a deejay before she was a recording artist, has always been skilled at synthesizing style, and here, she puts that trained ear to work, effortlessly fusing pop, late-night R&B, hip-hop, and a pinch of island music, too. We’re ecstatic to work with Shellz to share “Slide” with the world! Please let us know what we can do to get this clip included in your regular programming and online presentations, or if you’d like us to send some Shellz merch for on-air contests and giveaways. Contact Andy Gesner and the HIP Video Promo crew at (732)-613-1779 or e-mail us at info@HIPVideoPromo.com. You can also visit www.josephmarketingentertainment.com/shellz for more info on Shellz, or www.instagram.com/djshellz for the latest updates.